Donkey Kong Country was one of those games that made the Super NES console a "mom please buy for me" in my household. Except that by the time it was in wide release, mom wasn't paying my bills any longer, so I had to do without. I did play the game, however, eventually, on a friend's SNES, and the experience was everything I'd hoped it would be. 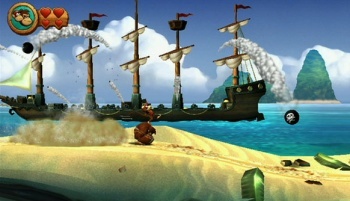 DK Country was a platformer in which you jump, run and bash your way through various jungle-themed obstacles, utilizing barrel-shaped power-ups and occasionally partnering with Diddy Kong to tackle unique challenges. Donkey Kong Country Returns ... is exactly the same. But newer. And, one assumes, better. Utilizing the slightly-better-than-the-SNES graphics muscle of the Nintendo Wii, DK Country Returns takes you back to the jungle for more jumping, swinging and bashing mayhem. I was able to spend about 15 minutes with it on the E3 show floor, which was just enough time to watch one person play through a level, and to play through another on my own. In true Nintendo style, the platforming gameplay is excellent, and the Wii controls handle the experience gracefully. DK Country Returns is expert level platforming, though, so be warned. This is not Kirby. With the difficulty set to "easy" there was still plenty of dying, yelling, controller gnashing and threats to toss the Wii Remote into the next booth. As hard as it is, though, it makes sense and is fun. It's a satisfying play experience if you have the patience and skill to tackle it. Donkey Kong glides with the grace you'd expect of an 800+ lb. gorilla, but rocket barrels and Diddy Kong's helicopter backpack mix up the gameplay a bit, and the return of the runaway mine car levels will delight casual fans and series veterans alike. Plus, you get to bash things. Expect the game to release sometime this holiday season.